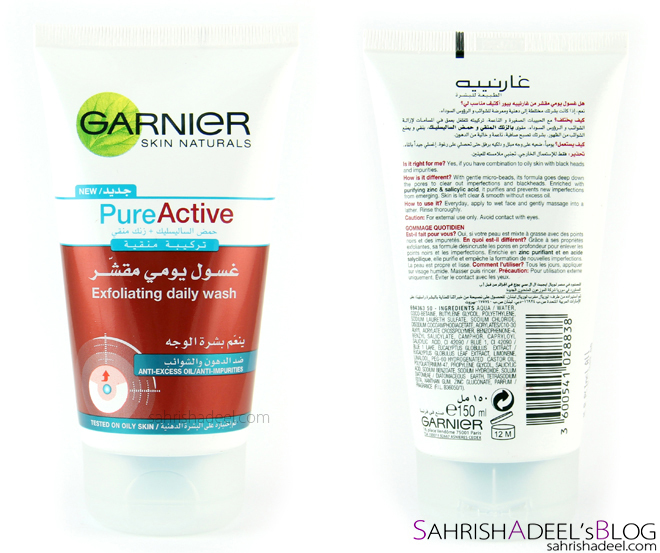 Garnier Pure Active Exfoliating Daily Wash - Review | Sahrish Adeel - Malaysia based Pakistani Beauty & Lifestyle Blogger! Those times are gone when one beauty soap was enough to use for face, hands and body. Now, we have specific products for everything, atleast in my case. 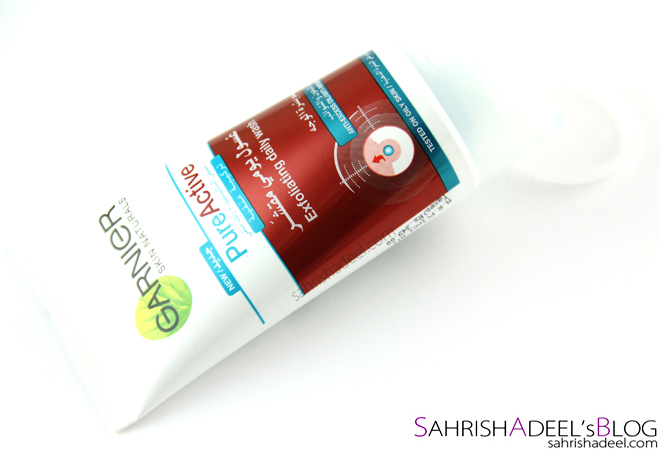 Garnier has always impressed me when it comes to their face washes and today we will see if their Exfoliating Daily Wash worked for me or not. 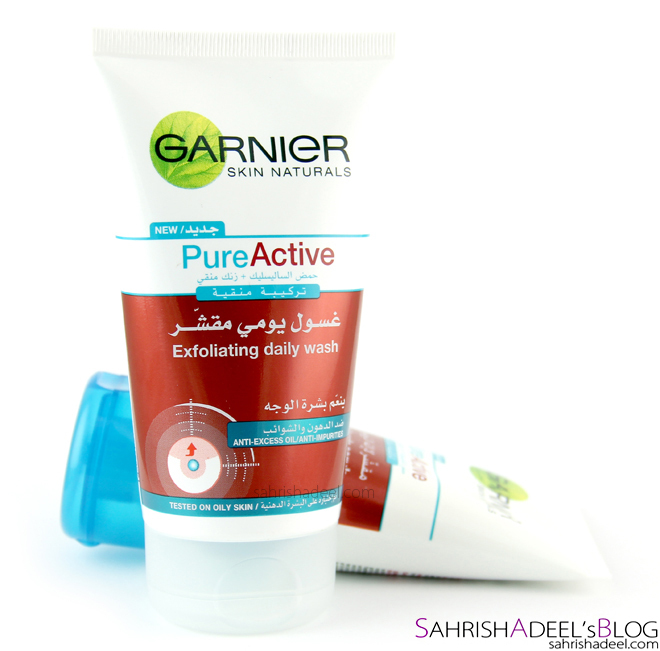 Exfoliating Daily Wash is from Garnier's range called Pure Active. The whole range is designed to clear impurities instantly and to keep them away from skin. This face wash comes in a tube and contains 150 ml of product. 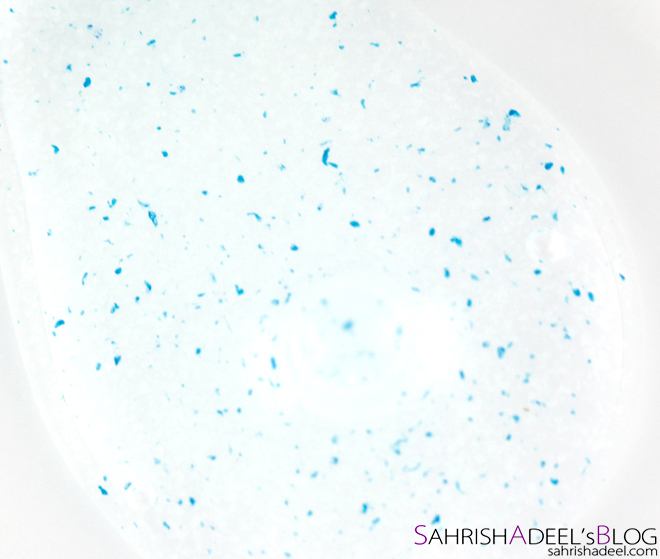 Back to the point; feel, texture, fragrance and consistency of Exfoliating Daily Wash is quite similar to Gariner's Pure Exfoliating Face Wash that I reviewed sometime back. I wasn't too happy with that one and I thought I got the same and may be the packaging is different but then I noticed the difference and actually found Exfoliating Daily Wash pretty good. It actually exfoliates my skin slightly on regular basis and I can see a good improvement on my patchy/dry areas. The amount of blue granules is more than the face wash I previously used but it is so fine and not at all harsh on my skin. It does not exfoliate too much but people like me who prefer to exfoliate a bit everyday/twice a week, will find this suitable. The products claims to be anti-excess oil and I must say that it really helps to keep my t-zone oil free for good two-three hours and rest of my face for about four hours which is pretty good for me in this hot and humid weather. A normal face wash would work for may be maximum 1-2 hours on my skin. It also claims to keep impurities away but I am not sure if it really keeps them away or not because at the end of the day, my face is a mess anyways. The fragrance is mild too but it is bitter, like if it has Neem or some leafy extracts. Thought I could not find anything in ingredients. and just a pea sized amount is enough for one wash. I use this face wash every morning and it really helps to keep my skin smooth and shine free for good time without drying out the skin at all. I have been using this face wash for a few weeks now and I am really loving it. 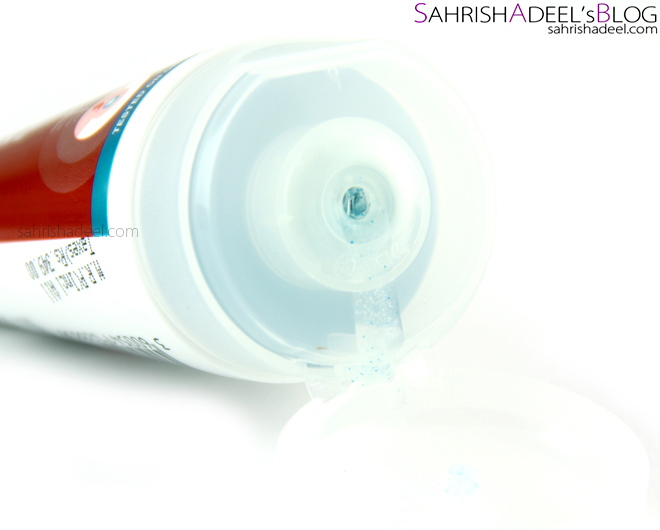 Each tube costs PKR 349 and is available all across Pakistan. This product is also available in other countries, so do check your nearest drugstore for the availability. Check out Garnier's Pakistan Facebook page for more updates on their range.